With the right fence, you can significantly reduce sounds around your home for some added peace and quiet. Noise is an inevitable factor in almost every neighborhood. However, with the right fence, you can significantly reduce sounds around your home for some added peace and quiet. Enjoy a quiet afternoon in your outdoor space with a new fence for your home! As you plan your home projects for 2019, consider the many reasons to add a new fence to your outdoor space next year. Your fence is an essential element of your home exterior. For neighborhoods that are particularly noisy due to traffic, a new fence can make all the difference. 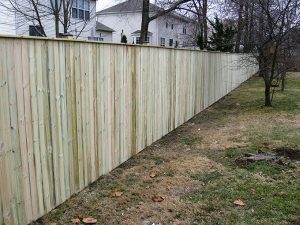 A wood fence would be a great solution, particularly if used for a privacy fence. However, your height options may be limited based on neighborhood restrictions for how tall you can build your fence. With a new fence, you can also ensure that there are not any holes or openings to allow sound to get through. The second step to reducing sound in your yard is to landscape your property for the new year. In addition to your new fence, landscape features such as hedges, bushes, and trees are also great for reducing sound in your yard. Landscaping will help to reduce noise pollution around your neighborhood while also enhancing the curb appeal of your home. Adding an outdoor feature such as a gazebo, pergola, or an outdoor kitchen can also help to reduce the noise surrounding your home. Not only will an outdoor feature complete the look of your landscape, but it will also help to fill your yard and reduce the sound circulating in your outdoor space. Complete the look of your beautiful new fence with great landscaping and an outdoor feature for a peaceful space on your property next year. Mid-Atlantic Deck & Fence has almost 30 years of experience in building beautiful custom fences, gazebos, screened-in porches, and decks throughout the state of Maryland. We have the expertise to design your dream fence or custom deck and have it installed in a headache-free process. Give us a call at 1-800-833-9310 or visit us online for a quote today! We offer many different styles of fencing and decking in addition to custom options designed specifically to suit your preferences and tastes. To see examples of our work and get more tips on how to choose the right decking for your family, follow us on Facebook,Twitter,Houzz,Pinterest, Google+, and YouTube.